Maybe I should have titled this post The Restorative Properties of Floating on Oats. Strolling through this oat field, damp to my waist, encountering a parade of mares and foals in pairs casually maneuvering through the dewy field quickened my senses and filled me with calm. I have said it many times in this blog: the healing power of outdoor experiences is real and more necessary than ever is our overly stressed culture. Even short doses of nature, or even pictures of natural landscapes and wildlife, can reduce stress and sharpen mental performance. I saw some recent data that pointed out that the majority of adults (on the planet) spend more time in their cars than outside, and that teenagers admit to only spending (on average) about ten percent of their day in an outdoor setting. I am grateful for That Herd everyday and I hope the visitors to this blog are too. When was the last time you went outside and did something? 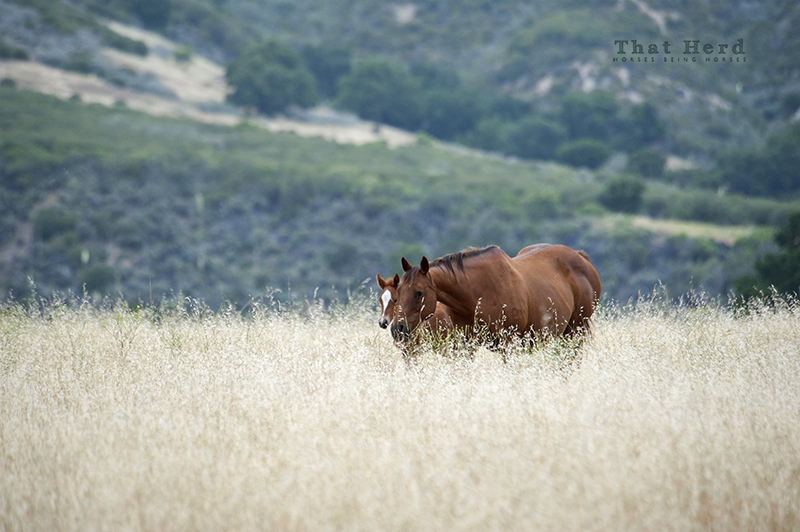 Like a boat bobbing in a sea of belly-high oats, a mare and foal float into view during an early morning exploration.